I've always loved pineapples. Food, stationery, home decor, it's all good. Named after the pine cone because of the spikes and cone shape, they are a symbol of hospitality and in some instances, wealth. I first noticed them as a colonial symbol when visiting Williamsburg, Virginia. They are everywhere -- linens, soaps, dishes, etc. 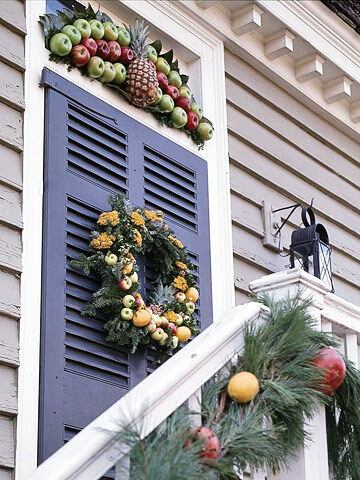 But what really blew me away were decorations like this at Christmas (source BHG). The whole area is lit up and decorated beautifully. I was stunned to learn that the decorations were made from real fruit! If you ever have the chance to visit Williamsburg at Christmastime, you'll discover a gem. I'm a huge fan of pineapples...didn't know that about Williamsburg. Your color combo is awesome! Love your packaging/tag. 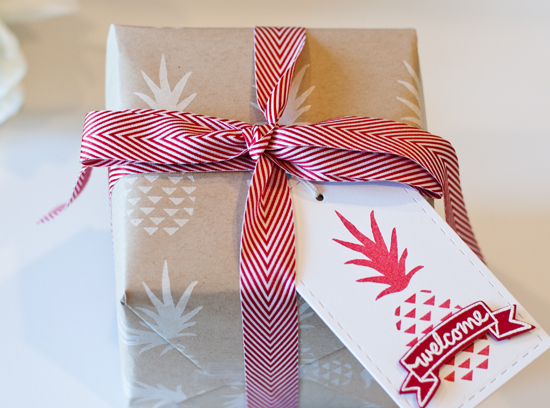 The decor is beautiful and so is your packaging and tag. This sure is The Land of Plenty.